Mold Level Corporation, an industry-leading disaster reconstruction and specialty cleaning company, located in Naperville, offers relief from building damage caused by water, storm flood damage, sink, bathtub or toilet overflow, toilet wax ring failure, sewage backup and other devistations that can cause a big headache. Our team of professionals has the experience and expertise to devise a plan to get your home, and your life, back to normal. There’s no disaster that we can’t handle. With more than 20 years of experience working with properties in and around Naperville, Schaumburg, Arlington Heights, Elgin, Lake Forest that have sustained damage following a flood, or natural disaster, we sympathize with your loss. That’s why we work to understand all of your needs and quickly and efficiently recover your property. We are a water damage restoration and cleaning contractor, providing solutions for damages sustained from water, water leaks, frozen pipes, sewer cleaning and damage, bursting indoor sprinkler heads, and more! 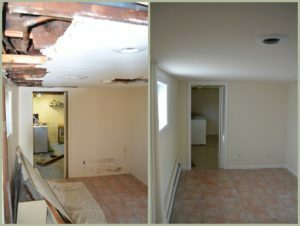 Your Water Damage Reconstruction Is Our Priority! Our team is standing by, ready to support your residential or commercial water damage reconstruction needs. Whether it’s an emergency situation or you’re planning ahead, make sure you hire Mold Level Corporation to do the job right the first time.